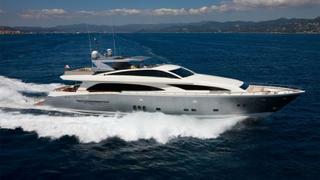 The 37 metre motor yacht Nyota, listed for sale with G-Yachts, has been given a €600,000 price reduction. Delivered by Couach Yachts in 2008, she was built to Bureau Veritas class with a composite hull and superstructure. Up to eight guests can be accommodated in four cabins, including a master suite, a VIP, one double and one twin cabin, all with en suites. Nyota, which means star in Swahili, can also host a crew of five. She underwent an in-house refit in 2016/17 that saw the addition of a Jacuzzi on the flybridge, new furniture, toys and upholstery of the master and VIP cabins and technology upgrades to the Sonos system, with improved Wi-Fi. Nyota boasts a modern and bright main saloon that features large windows, allowing for plenty of natural light, and has been designed in neutral tones. It offers a comfortable U-shaped sofa, a drinks bar and a dining table for up to ten guests. Outside, guests can sunbathe atop sunpads on the foredeck or by the Jacuzzi on the sundeck. The aft deck of this yacht for sale features an alfresco dining table seating up to ten people, additional seating and a bar. Power comes from two MTU 2,735hp engines that allow for a maximum speed of 30 knots and a cruising speed of 22 knots. At 12 knots she has a range of 2,000 nautical miles. Lying in Cannes, Nyota is now asking €3,900,000.